Here’s an overview of a standard Build And Capture Task Sequence. 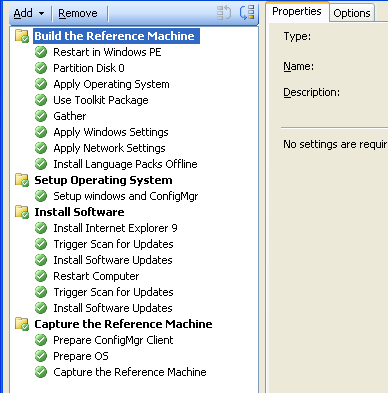 As you can see I’ve added Microsoft Deployment Toolkit to SCCM to get support for language packs in the image. Download the task-sequence here. Rename it to .xml afterwards and import it into SCCM. 1. First you will need a hotfix in your CM-Client package-folder. Download KB2509007. Run it on your SCCM-server, it will create a package for you with the unextracted files from the CAB in <server>\SMS_CEN\CLIENT\I386\HOTFIX\KB2509007. Make sure that this is the same path as the package source catalog for your SCCM client in your Task Sequence. Unless you apply this patch, the Task-Sequence will hang on “Installing Updates 1%” for 30 minutes and then time-out and fail. 3. Make sure that you have SMSSLP=<your SLP Site System> as a parameter to your CM-Client. In a Workgroup that’s the only way to find the CM-server unless you’re using WINS. And we’re not using that anymore, right? I did of course write Workgroup because Sysprep doesn’t work if your machine is in a domain. We’ll also add the Management Point for good measure. 4. In “Site Settings” -> Site Mode Check “Allow HTTP Communication for roaming and site assignment“. 5. Rebuild your Boot Image. I really don’t know why you have to do this after you changed the “Allow HTTP-Communication for…”. I can only assume that somehow that setting needs to be propagated to the boot image although I would think that that’s something the client would ask the MP for… I can tell you though that unless you rebuild your image you’ll be stuck waiting 30 minutes for the “Installing Updates” window to crash. If you’re booting from an ISO (VMWare/Virtual Box and similar) just create the new image as usual from Task Sequences -> Create Task Sequence Media. I’m using a boot image since I’m building my Base Image on a virtual machine which is more or less how you should do it since you avoid getting lots of unneccesary drivers in your Base Image. Since I’m building on a virtual machine I’m unsure if you need to do anything with the regular x64/x86 boot-images that come with CM (or the MDT-boot image that comes with MDT). Please send feedback if you’ve tried this! There’ll be lots of references to download.microsoft.com before that with error messages. That’s ok, that happens during the Windows-installation phase. The important thing is that the Windows WSUS-client finds your Software Update Point during the Install Updates-phase. 6. After the task sequence step “Setup Windows and ConfigMgr” you could normally run the built in task sequence step “Install Software Updates”. BUT as soon as you insert anything else before that, software updates will find no updates. Zero. Nil. Nada. As in my example above, you can’t apply software updates for IE9 before IE9 is installed and hence you need to install it before scanning for updates. Which will make the scanning for updates fail since it won’t find any new updates. So… enter the workaround script that I modified a little but comes from here! The script sets the registry values to your WSUS-server/SoftwareUpdatePoint and then it triggers a rescan.
' 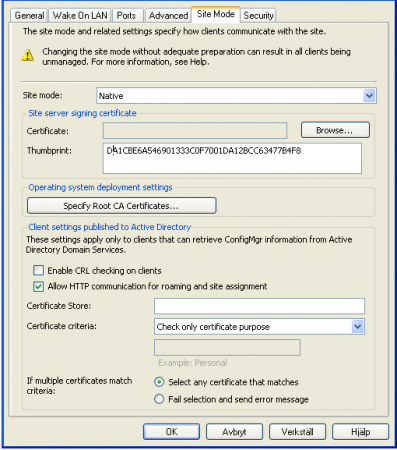 COMMENT: Sets registry keys to the WSUS/SUP-server and initiates a WSUS-rescan locally.
' Needed for Build And Capture image creation. Download the entire script here. Remember to change .txt to .vbs and insert your SUP/WSUS Servername into the script. THEN you can run the normal tasksequence step “Install Software Updates” afterwards. And you will actually need to run it a few times since many updates require a reboot before WSUS can apply even more patches. Note that I’m addressing port 8531 in my script since my SUP is on my SCCM server. 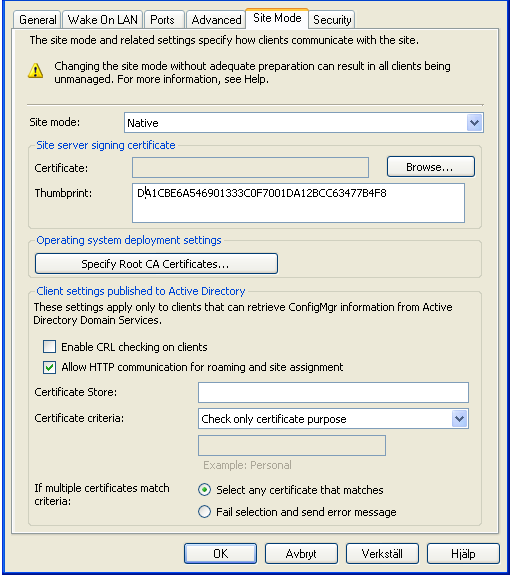 If you’re running your SUP on a different server than your SCCM you may be using port 80. That’s it! I can’t believe it took me a week to find that out… I hope this guide might help some other poor souls out there in the future. Create a Software Update Package that you advertise to the same collection that your Build and Capture Task Sequence is advertised to. Check that the computers IP that you’re building the image is in a boundary assigned to your site server. That the Software Update Package you’ve made actually is on a distribution point! Install Software Updates Offline is for injecting updates into an existing image. Not for Build and Capture. Microsoft doesn’t recommend you to build the image, join the domain, install patches, leave the domain and to the capture. You’ll get lots of GPOs messing with your base image and other traces from having joined the domain. I can’t express how much I apreciate it when a professional takes the time to write down an all-embracing “how-to”, including all the details he found during many hours of researches. We’re using SCCM 2007 for OS-Deployment since 2 years already and I stopped to count the attemps and the hours I already wasted to research and investigate in this toppic. Just a week ago I tried again to assign the most recent updates to our gold-image since it was the time to update it anyway with some other contents. I was googeling about 4 days went through 20+ blogs and found almost 80% of the hints you provide in your summary as well, but it still did not work for us, probably because we are working in a “worst case environment for SCCM” (native mode, WINS disabled…). Finally I guess that the last missing thing in our environment was the “Allow HTTP Communication for roaming and site assignment“ as well as the “Trigger Scan for Updates” step”. Thanks to you, everything works fine now and I can celebrate the birth of our first “UpToDate-Gold-Image”. Glad to hear Rudolf! Congrats on the new image! Many thanks for taking the time to post this. I’m hoping you can offer a little advice. I’m running SCCM 2007r3 in mixed mode, with WSUS installed on the same server but as a standalone WSUS (not integrated with SCCM). Should I be able to get your method to work? Failed to retrieve ‘PolicyRule’ from SUM policy. The system cannot find the file specified. (Error: 80070002; Source: Windows). The operating system reported error 2147942402: The system cannot find the file specified. I wasn’t really expecting it to work because there is another part of the process that I haven’t worked out yet. At the end of your guide you say “create a Software Update Package that you advertise to the same collection that your Build and Capture Task Sequence is advertised to.” I haven’t done this yet because I’m not sure what it means but I’m guessing that it refers to installs of WSUS that are integrated into SCCM. Also, I created a package containing the vbs script and specified this package in the scan for updates TS step. Is this the correct way to reference the script? Any ideas would be most gratefully received!